This month, the full moon falls on Friday the 13th. Despite many myths, the full moon does not actually embolden criminals, bring about births or make people mad, studies show. And while Friday the 13th superstitions may be well entrenched, there's nothing particularly special about a full moon falling on this date. The June full moon is nicknamed the "Strawberry Moon," a moniker that goes back to the Algonquin Native American tribe, according to the Farmer's Almanac. June is strawberry season, and the full moon would have traditionally coincided with the harvest. Here's how it works: The Earth rotates on a tilted axis; in June -- summer in the Northern Hemisphere -- the North Pole is tilted about 23.5 degrees toward the sun, while the South Pole is tilted 23.5 degrees away from the sun. On the solstice, the sun reaches its farthest point north of the equator. Full moons happen when Earth's satellite is opposite the sun; that's why viewers on Earth see the entire face of the moon illuminated. Thus, when the full moon is directly opposite the sun when our host star appears at its highest point, the moon is at its lowest point with respect to the equator. That's why winter full moons rise higher above the horizon than summer full moons. June's moon reaches its fullest point at 12:11 a.m. EDT (0411 GMT) on Friday, June 13. 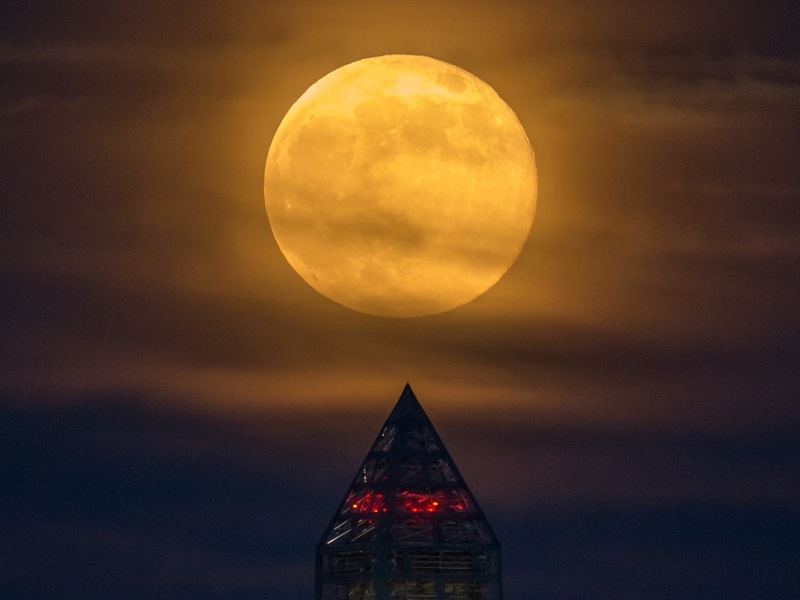 Of course, this means that for people in the Central, Mountain and Pacific time zones in the United States, this full moon isn't a Friday the 13th full moon at all: It technically falls on June 12. Friday the 13th full moons occur sporadically. The last one fell on Aug. 13, 2011. The next Friday the 13th full moon will be on Aug. 13, 2049. Even those who live in the Eastern time zone should not stress over the confluence of the full moon with Friday the 13th. Contrary to myth, the full moon does not affect human behavior or health. For example, a 1985 review published in the journal Psychological Bulletin tracked hospital admissions, psychiatric disturbances, homicides and other crime over several months and found no uptick in any of those variables around the time of the full moon. Alas for heavily pregnant women, a 2001 study in the Bulletin of the American Astronomical Society looked at about 70 million births in the United States and found no link between the phase of the moon and labor starting. So don't expect to finish your pregnancy just because the moon is full. Studies have also shown that other phenomena, including seizures, crime and heart surgery outcomes, have no link to the full moon. Pet owners might want to avoid walking their black cats under the full moon on Friday, however. One 2007 study of pet injuries published in the Journal of the American Veterinary Medical Association found that emergency vet visits for cats were 23 percent higher on days around the full moon. (Dog visits spiked 28 percent on those days.) Researchers speculated that people might use the extra light of the full moon to stay out after dark with their pets, perhaps boosting the likelihood of injury. Editor's Note: If you have an amazing moon or general science photo you'd like to share for a possible story or image gallery, please contact managing editor Jeanna Bryner at LSphotos@livescience.com.